If ever I was to leave my home in Hexham it would probably be Tynemouth I would consider moving to. I fear however it would be to the detriment of my health. As good for you as the sea air and walks along the beach are the plethora of new and established restaurants and bars Tynemouth now houses has made the coastal town a fabulous and far too tempting place for a night on the booze, a meal out or more likely a combination of both. The restaurant blends a real fusion of Asian cuisine. Whether you are a fan of the cleanness of Japanese, hot and sour of Thai or Vietnamese or the richness of Indonesian there will be something for you to attack with your chopsticks and satisfy any palate. The menu itself is comprehensive with a mix of Sushi, Asian Tapas, Dim Sum, Noodle dishes and a Taste of Asia offering. We were met by a truly charming front of house. A pint sized bundle of infectious energy who made us feel both welcome and completely at ease. So often the very first impression of your dining experience is governed by the meet and greet. I understand particularly when the house knows I am conducting a review there is an eagerness to almost over deliver service but she was a great mix of humour, a little cheek and friendliness. We were sat on the mezzanine floor, which I prefer to be honest to be able to keep an eye on fellow diners to check if their dining experience mirrored my own. So what shall we order? Well drinks first.. A couple of pints of Singa, although had I not been driving I would definitely suggest you take a look at the excellent cocktail menu! Tapas to start and immediately one jumped out. I have always wanted to try Alaskan King Crab.. At this point I will pause to remember the countless fishermen that lose their lives harvesting this magnificent crustacean……..But oh my god it’s good. It’s better than lobster I kid you not. Served chilled with a wasabi mayonnaise. In addition crispy pork belly served with a hoy sin reduction and a really unique ginger sugar. The pork was cooked to perfection, soft tender flesh with a light crispy skin. Gently dipped in the hoy sin and then the ginger sugar it was a cracker. My partners choice was a little more difficult as she had forgotten her glasses but the staff on hand spoke expertly about each dish and she finally chose Chilli and Cashew King Prawns and Duck Spring Rolls. Both on arrival were greeted by similar audible Mmmmm’s of delight as had met my crab and pork. I did of course try both merely for research purposes. One of the benefits of choosing the tapas is it gives you great variation. Perhaps too often we find ourselves taking the “safe” option rather than opting for something different. When I come back next time it will be with a big group so I can take advantage of the choice. Don’t you just hate food envy! Its something I suffer from a lot. You look at the menu and decide what you want only for a friends food to arrive and make yours look like something Oliver Twist would turn his nose up at! It is for this reason that I would say that the tapas is the star of the Buddha Lounge menu. We both chose a main dish from the Taste of Asia menu. Mine was the Szechuan Beef with sticky rice and hers a Indonesian classic of Chicken Satay again with the sticky rice which was served in a steamed banana leaf. The beef delivered again where the tapas had left off. Each piece coated in a sweet and slightly spiced glaze which when coupled with the rice really hit the spot, even if by this time our choice of 4 tapas was beginning to backfire a little; (note to self.. Elastic top pants next time.) Many of us will be familiar with Chicken Satay the rich and creamy dish with a mild, garlic, curry and peanut flavour. The chicken again was perfectly cooked but sadly we were both defeated and ridden with guilt couldn’t finish! I’m not one for heaping undue praise on a restaurant but I do like to accentuate the positive. 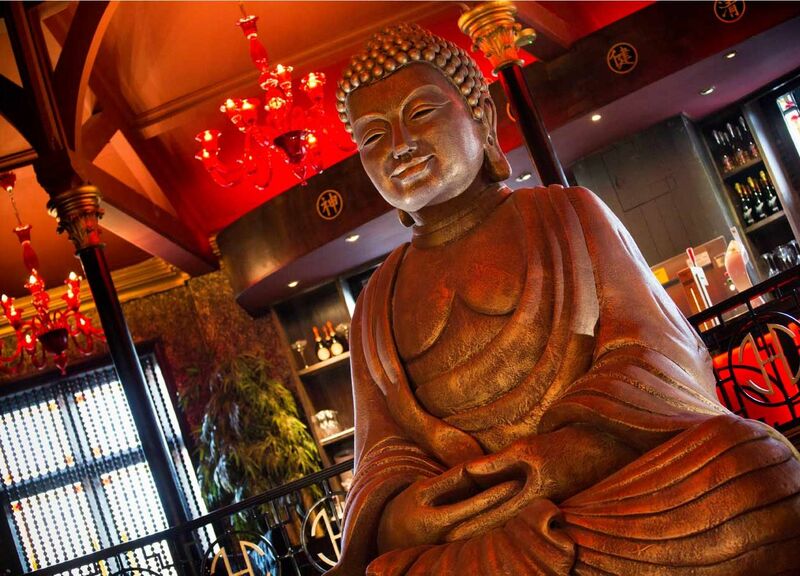 If you are looking for a dining experience with a fun, bustling atmosphere then the Buddha Lounge wont disappoint. If you just want to pop in for a drink you can do so downstairs which I think only adds to the atmosphere. They are open for both lunch and dinner and open until late on the weekend. Give it a try I’m sure you wont be disappointed! You can book by phone 0191 270 8990. Check them out on Twitter @buddhaloungetm or on Facebook Buddha Lounge Tynemouth. Thank you to all the staff at Buddha I will be back and in greater numbers….You have been warned! !